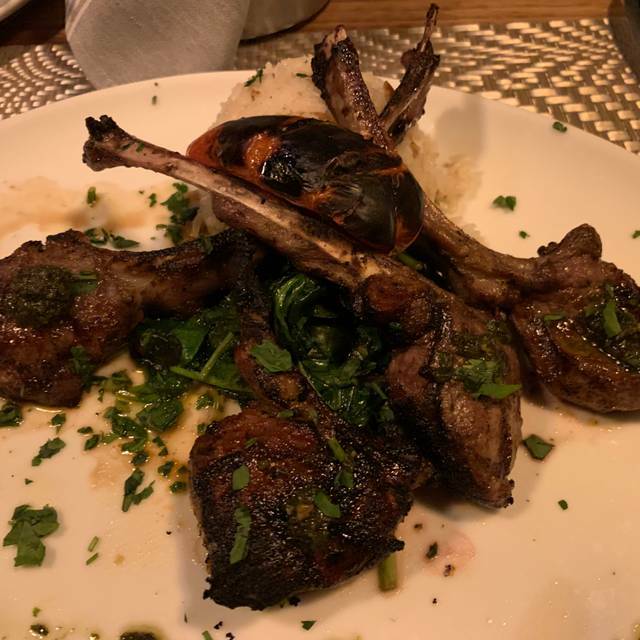 Enjoy a traditional Mediterranean meal with family and friends at Truva Turkish restaurant in Virginia Highland, one of the city’s hidden gems. Serving a variety of flavorful, authentic dishes in a warm, vibrant setting, our Turkish restaurant is the perfect place to get together for a business lunch, dinner date, or drinks. We offer a full bar and an extensive wine list. If you're looking for a place to enjoy authentic Turkish food in an upscale and beautifully decorated setting, come to Truva and we'll show you a good time. I was hoping I could tell folks about this new restaurant in our neighborhood! We all had different delicious meals and appetizers. The space has been beautifully transitioned from American Rosdhouse. Service was perfect. Enjoy the vegetarian moussaka like I did!! Been there twice. Great service. Nice atmosphere and friendly feel. The food has generally been very good but I had one poor dish last time out - "Doner" kabob that was simply dried out something or other, not a kabob and tasteless. The waitress hinted that I should not order but I did anyway so who is to blame here. Food is true to Turkish Kitchen. Waiter was 5-star. Sophisticated decor. We love middle eastern food. I went with my gluten free daughter so this is also a gluten free review. We went late so it was not very busy so I cannot attest to the noise. It is hard to believe this was our beloved Roadhouse. Very transformed. I first want to say, I love octopus. Pulpo as I often see it. And the appetizer was perfect. Usually places make it rubbery and bland. It was soft, juicy and delicious, on a bed of the most creamy hummus you have ever had. That said, there were two small pieces of meat for $13. I thought it a bit overpriced but it was really good so I probably will splurge again. I also had the lamb kebobs for the meal. And it did not disappoint. Perfectly done. Soft, not gamey, great flavor. Usually kebobs are tough but these were the best kebobs I have had in Atlanta. For the gluten free review: first the menu has all items they consider gluten free with a GF. Which is helpful. However that was more limited to vegetarians and my daughter wanted meat. We asked if we could make the meat dishes GF and they said that the only part that was not gf was the “rice” which they said was orzo though listed as turkish rice. So she had the shrimp dish with fries instead of “rice” and the shrimp were massive and again perfectly cooked. Great sauce that she put the fries in over the offered ketchup. Now I had the “rice” with my meal and it tasted like really well seasoned rice. I am not sure that it is orzo really. So I am not sure if it has gluten. I would want to speak with the manager in the future to know why the meat dishes are listed as non GF. Perhaps the marinade? More info is needed. But my daughter hates when I ask about it in front of her so I did not find out. We finished with the flan. It is not like other flan you have had. Much heavier. Very rich. Slight toasty flavor. Good but hard to finish even for two sharing it. All told, too much money for an every day place but fab food and ambiance. Will definitely be back. Lots of fun for groups. Great selections of mezzes— make sure to try the dumpling. We loved everything! Definitely a neighborhood gem. Order the lamb... it’s absolutely delicious!! Excellent food and service. Will be back soon!! Very attentive service and the food was fun and good. We love Turkish food and had high hopes for the new Truva location in VaHi. It had only been open for a couple of weeks when we went last Saturday night, and I must say that they still have a few kinks to work out. While our server was very friendly, it seemed like he had too many tables to cover and the result was less than optimum service. We ordered the Falafel to start and unfortunately were unimpressed...lacked taste and was overly heavy. We decided to try the mixed grill as a main course...which was pretty good...but was a bit light on quantity in my opinion. They could have added more grilled veggies (peppers and onions would have been nice) as a way to increase the size without adding to the cost. We will go again in a few weeks to see if the service is better and will try other items on the menu. We're hoping we just ordered the wrong items and the restaurant will run more smoothly with some time under their belt. Truva just opened in Virginia-Highland where American Roadhouse used to be. The interior is completely revamped. Lighting is a little bright, the backless benches at many tables are not comfortable, and some tables face into the beverage dispensing area which is not a great view for diners. The staff seems very friendly and the service was good. The timing of the delivery of entrees after we had finished our appetizers seems a little long but not a big deal. The Turkish dumplings appetizer was great as was the lamb kabob. Reasonably priced wine list. Give it a try. Fantastic food. Wonderful atmosphere. Service was good. Food was really great and our server was fantastic. She checked in frequently, brought refills of water and was really attentive and suggested great dishes to try. They did a really nice job building out the space that used to be Road House ( and thank you for new bathrooms ). We ordered lots of appetizers and salads and just sampled and still had leftovers. Few nitpicks that I believe are kinks to be worked out. I had a 7:30 reservation. We were told they were running late, even though we showed up on time. We didn't sit down till 8:15. Drinks from the bar were really slow for 2 glasses of wine and a bourbon. I think Truva is still trying to figure out how busy they'll be and how much wait staff to have. It seemed a bit understaffed to me, but everybody was trying hard, no doubt. And lastly, it was really hot in there. I didn't get the Lentil soup for that very reason and multiple tables were using menus as fans. Keep at it guys. Virginia Highlands welcomes new restaurants. I'll be back ( in a t-shirt ). We had a really nice time with friends at Truva. It's exciting to see a new restaurant in V. Highlands. Our server was fun and helpful. The menu has so many good options. The food was fantastic. For sure, we are going back. So glad Truva is in the neighborhood. Everything was delicious and they've done a beautiful job with the restaurant design. Dining at Truva was a very enjoyable experience. We can't wait to go back and try something else on the menu. My boyfriend and I went here for Valentine's day after seeing stellar reviews. The staff was automatically cold to us and pushed a 60 dollar prix fixe course on us which didn't have anything we liked. They also seemed put off when we didn't order alcohol, though we don't drink. We decided on this lamb flat bread which had hardly any meat and cheap iceberg lettuce served like a taco. I got the stuffed eggplant which was just a soggy eggplant with slimy peppers and absolutely no seasoning. It was not worth 16 dollars. My boyfriend got grilled chicken skewers for 19 dollars that could truly have been cooked in 5 minutes from my kitchen. There was also little seasoning--certainly nothing "Turkish" about any of it. And the grilled vegetables were a bit burnt. I only took one bite on my food and the server didn't even to bother if everything was okay. Not to mention the lights were fully lit...no ambiance. And the music ranged from oldies to club pop music to "Hallelujah" by Rufus Wainwright which is probably one of the saddest songs there is. ON VALENTINE'S DAY!!! I will absolutely never go back nor recommend this restaurant to anyone. Excellent food and very friendly stuff!!! Definitely will be back!!! The food was freshly prepared and delicious. We had the octopus appetizer, the Turkish zucchini pancake, and the stuffed cabbage. All three were good, but the stuffed cabbage was my favorite. It was covered in a great tomato-based sauce with Turkish spices and drizzled with really good yogurt. The wait staff and manager are very excited about the place and eager to make recommendations. The manager came to our table to ask how things were. The price point was reasonable. The cocktail menu looked interesting, but we did not have a drink. The space is huge, but they have done a good job of breaking it into smaller areas and making it seem cozy. All in all, I would highly recommend Truva in Va Highlands. Great addition to Va Hi! The food was authenic, fresh, delicious and the wait staff very attentive. Highly recommend. Nice ambience. Food overpriced and has room to improve; quinoa appetizer tasteless and lamb kabob over cooked. It was so delicious! Babaghanoush, falafel, lamb, baklava...we'd order it all again! And free parking makes it even better. Not knowing anything of Turkish food I found it delightful, interesting, exotic and delicious. Six of us split 4 appetizers and 3 dinner entres. Our server was friendly, knowledgeable and helpful. But the bar service was just terribly slow (they had just opened). IT'S LOUD, but no more than many other restaurants (why is this?). Bottom line: we will return. The food was great. It was the best local tabbouleh I've found in Atlanta (I am Lebanese and grew up on it). We shared a mixed grill for four and it was absolutely delicious and plentiful. All of us really liked the food and the renovation they have done from the American Roadhouse. The manager was attentive and friendly. The service as a little spotty and it seems they may have some tweaking to do with the wait staff. But I chalked that up to having been open just a week or so. We will all go back. We have been waiting for a new, reasonably priced, good restaurant in the area for a while. Welcome to Virginia-Highland, Truva! The restaurant hits the mark on almost every level to make them a neighborhood mainstay and dining destination for those traveling from elsewhere. We tried 2 cold meze (babaganoush, stuffed grape leaves) and 2 hot meze (falafel, mini lahmacun) along with an adana (lamb) kabob. We finished things off with sweet, fresh and flakey baklava. The complimentary bread and sun-dried tomato spread was delicious. Everything was flavorful and plentiful. Despite only having been open for 2 weeks or so, the staff were attentive, familiar with the menu and friendly. Prices were what you'd expect for the quantity and quality of the food. This isn't a fast-casual restaurant nor is it a fancy, pretentious dining establishment. It's one of Atlanta's many moderately priced, quality restaurants. The decor is fairly simple and comfortable with a warm ambiance. It was fairly noisy with other customer chatter so perhaps some sound dampening efforts would help. We'll be back and look forward to enjoying good quality Turkish food on a regular/monthly basis. Food was inventive and delicious. The service was attentive and I think they are working hard to get it right. I thought, for only being open a week, they did a great job. A couple of tiny hiccups, but, that's to be expected. We went early, so we got a reservation, but, by 7:30, they were jammed. Really loved the sundried tomato jam that came with the bread and the artichoke bottoms were delicious and presented well. My husband and I both had the chicken kabobs and they were very well prepared. Very convenient location and they have parking on site with NO FEE! In this town, that's a huge plus to me. Was delicious and inside is well done. Beautiful really. Drink service was a little slow initially and lag between apps and dinner. However food was amazing! We had lunch this week at the new Truva in Va Highlands. I wasn’t sure what to expect since it is new and hasn’t had a chance to work through all the kinks of opening a restaurant. It was SO good! The Turkish food was great and the new decor ( the old American Roadhouse location) is beautiful. I throughly enjoyed it and will return soon to try dinner. They are also serving favorites from the American Roadhouse menu for brunch on weekends. Fantastic dinner at Truva. Welcome to the neighborhood. The food was great as was the service. Not bad for their first week open. Place looks amazing and thank you for keeping some of the American Roadhouse favorites on the weekend brunch menu. Looking forward to coming back soon.